This captivating, silver-plated vine and leaf jewelry set is adorned with luminous freshwater pearls, glamorous marquise and round cut rhinestones, and vivid Aurora Borealis (AB-Reflective) rhinestones. 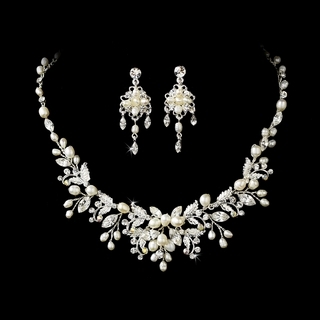 This gorgeous jewelry set would look wonderful on any classic or vintage-inspired bride! Size: The necklace measures 15-1/2" long with a 2" adjustable extender. The matching earrings measure 1-3/4" long.